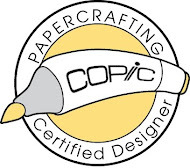 Today is an exciting day at One Crazy Stamper and High Hopes Rubber stamps as the newest release goes live today, and the new images are so cute. They all celebrate the coming seasons - Halloween and Christmas! To help celebrate, the design teams of both One Crazy Stamper and High Hopes Rubber stamps are inviting you to join in a blog hop. This cute image is High Hopes Snowman Snowball available here. I have colored the image with Copic Sketch markers, then added Stampendous Fun Flock to the fur trim, and gold metallic highlight with a Wink of Stella brush. The sentiment is also from High Hopes Rubber Stamps and is available here. To finish off the card front I placed a dot of blue Viva Décor Pearl Pen in the center of each snowflake. 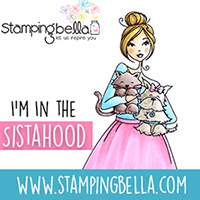 Drop by the One Crazy Stamper blog and make sure to join in the fun of the blog hop!! Your next stop on the hop is Lisa. What a super cute card and image! I love all your snowflake embellishments! Shari, your card is so fun!! Loving this new image and you coloured it just beautifully! Love the touch of Fun Flock on this super cute image! I just love, love,love your card. I think these little guys will be my first purchase. I love the happy snow friends. Your card is just that..amazing! Very cute card and fun image of the snowmen! So adorable Shari, love it!! A super cute card. Love it. You did such beautiful card, love the paper combo color and those embellished are just perfect for this card! Great image, and the paper is so pretty, love this card, great job! Such a cute image! Your colouring is beautiful! Gorgeous card! Fabulous colouring, Shari! Just love these colours and Snowman Snowball is sooo adorable!!! I just love snowmen beautiful card!